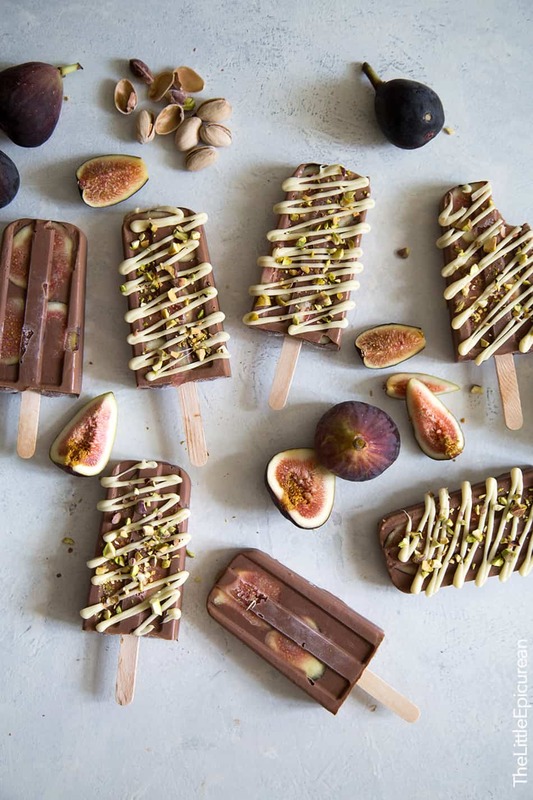 These fig fudge popsicles are a sweet way to enjoy the remaining days of summer! Over the weekend I started and completed the first season of Stranger Things. I AM OBSESSED. I need to know more about the Upside Down. Another thing on my radar: FIGS! Fig season is upon us and figs are everywhere! Last year I made these whiskey yogurt fig popsicles. They were tasty and dreamy. Today, I’m sharing an even BETTER popsicle recipe. 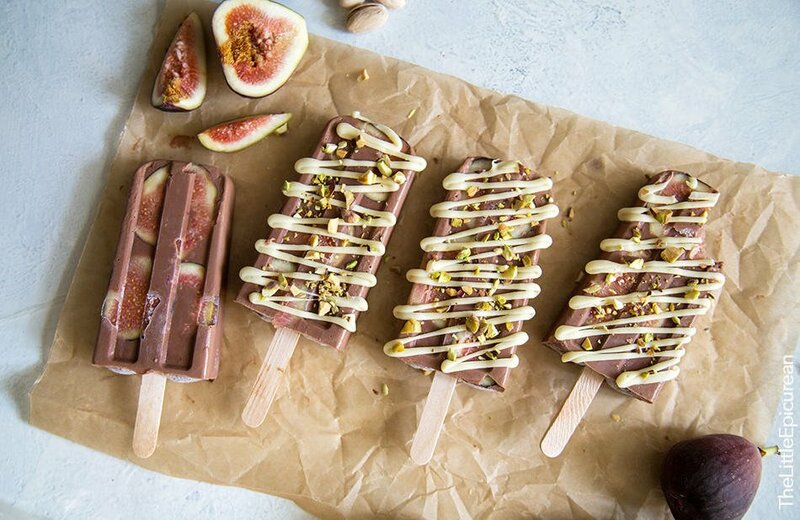 Fig fudge popsicles with white chocolate drizzle and chopped pistachios. As a kid I didn’t really like fresh figs. I mainly consumed figs via Fig Newtons and dried figs. These days, I can’t get enough of the fruit. I’m sharing numerous fig recipes: fig pistachio bostock, fig prosciutto pizza, caramelized fig ice cream. 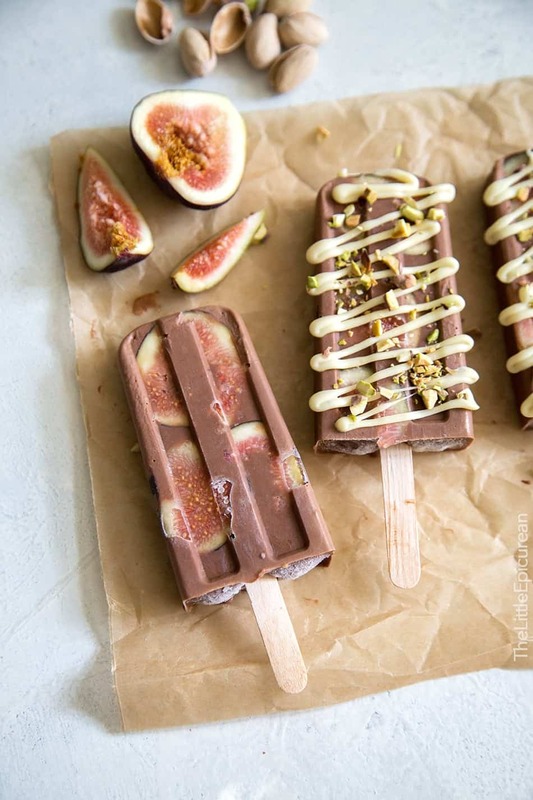 This fig fudge popsicle is an adaptation of the frozen fudge bars I made a couple years ago. They’re jam packed with chocolate flavor. Why is there cornstarch in a fudge popsicle recipe? Don’t be alarmed by the addition of cornstarch in the recipe. It’s mainly to thicken the popsicles. Just be sure to let the milk mixture come to boil to cook out any unwanted cornstarch taste. Figs and chocolate make an excellent combination. Then again, chocolate works well with pretty much any fruit (strawberry, orange, banana, kiwi, etc). Best of all, I don’t feel so bad eating these fig fudge popsicles for breakfast because of the fruit. These also make for great snacks while Netflix binge watching. In a heavy bottomed sauce pot, whisk together milk, cream, and sifted cornstarch. Bring to a boil. Remove from heat and add cocoa powder, sugar, and salt. Whisk until cocoa powder has dissolved. Place chopped chocolate in a large bowl. Pour hot liquid mixture over chocolate. Let sit for a few minutes to allow chocolate to melt. Mix until chocolate has melted. Let mixture sit for 5 minutes to cool. 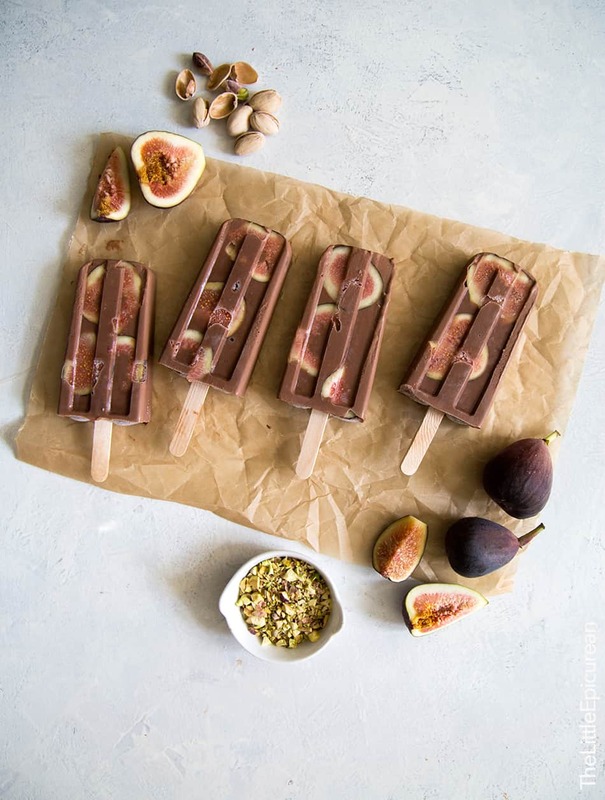 Place sliced figs in popsicle molds. Use chopsticks or the back of a spoon to press the figs to the sides of the mold. Gently pour chocolate mixture into popsicle molds. Insert wooden sticks into molds and freeze for at least 4 hours until fudge popsicles are solid. Drizzle melted white chocolate over frozen fudge popsicles. Top with chopped pistachios. Enjoy immediately! I use this popsicles mold from Amazon. These look amazing!! Grown up/ gourmet popsicles! Those are some elegant popsicles! LOVELY. What a good looking Popsicle! Very creative! I love how grown up these popsicles look!! :) YUM!! OMG! I love these! Cannot wait to try these! These are so fun! Love the almond toppings! These popsicles are absolutely gorgeous! I love those toppings, too! I haven’t started Stranger Things yet. I am trying to finish the last season of Arrow, and I plan on starting it before I catch up on Once Upon A Time. Everyone seems to love it so I can’t wait to see it! As a kid I loved fig newtons. That was where my fig knowledge began and ended for year until maybe sometime in college. I hadn’t even seen what an actual fig looked like! Like you, I am not obsessed and I can’t wait to see more recipes. I am in love with how these popsicles look!